Fiat have entered the pick up truck market with the new Fiat Fullback which comes with four wheel drive (4WD) as standard across the entire range. It has an exclusive 4WD electronic selector that allows you to distribute maximum torque to each wheel. Its exceptional off-road capability is matched by a towing capacity of up to 3.1 tonnes from its 2.4 litre diesel engine. The Fullback boasts a load capacity of 1 tonne and a cargo bed that is 1,520mm long and 1,470mm wide. Despite being 5.2m long and 1.8m wide in total, it has a turning circle of just 5.9m making it well adapted to city life as well as off-road. As standard, the Fullback receives a radio and CD player with Bluetooth hands free connectivity and 4-speaker sound system. It has a keyless entry system, manual climate control as well as front and rear armrests to provide comfort to everyone on board. 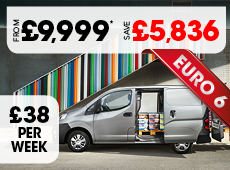 The Fullback Pick-Up is available from only £189 per month. That is just £42 Per Week!